The OLD FLORIDA FESTIVAL is designed to preserve and protect the local traditions and folkways that are rapidly disappearing from our daily lives, and to pass this important heritage to the next generation of citizens. This colorful, living history event is a key part of the museum's educational mission and has received high praise from local educators for its interpretive quality, authenticity, hospitality and the overall excellence of its presenters. Proceeds from the OLD FLORIDA FESTIVAL help to fund the Museum "express" a highly successful Friends' program that underwrites transportation costs for Collier County students and enables classes to visit the Museum when no other funding sources are available. OLD FLORIDA FESTIVAL is a celebration of 6000 years of South Florida history and features a sampling of the people and events that have shaped our past. The festival is open to the public from 10:00am to 5:00pm both Saturday and Sunday, rain or shine. Approximately 5,000 to 6,000 visitors attend. A typical OLD FLORIDA FESTIVAL consists of 70 or more participants arranged in historic "camps" that portray a specific era in Florida history. 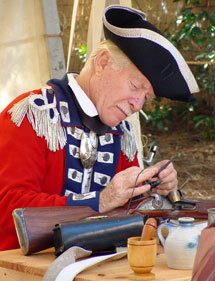 Re-enactors and craft workers provide continuous drills and demonstrations through first hand impressions. Participants develop and display historical artifacts and materials in their camps and encourage questions from the public. A growing number of period vendors or sutlers also attend, offering reproductions, art, food, gift items and historically correct goods for sale. Participation in the event is by application and invitation only. A small admission fee of $5 is charged for adults, students $2, with children under 8 admitted free. The OLD FLORIDA FESTIVAL will be arranged on the museum's festival grounds in distinctive groupings or camps with each representing a particular cultural theme or era in Florida history. Direct descendants of the nomadic bands, which first crossed the Bering Strait, Paleoindians populated Ice Age Florida. With his stone tools and atlatl-spears Paleoman hunted mastodon, bison, camel and horses, more the 8000 years ago. Small wandering groups of hunter-gatherers made their home here, leaving behind the first evidence of pottery, weaving, and basketry. Observe how our stone age man made and used flint tools! Builders of shell-mounds and complex canal systems, the Calusa developed a society, which included specialized classes of workmen, artisans, warriors, priests and nobles. A non-agricultural people, they harvested the riches of the mangrove estuaries, and politically dominated all of south Florida. They fiercely resisted Spanish conquest, but succumbed to European diseases, disappearing completely by 1740. Watch the Calusa make and use shell tools and palm-fiber rope. Los Hombres de DeSoto: Arriving in La Florida with Ponce DeLeon, then later with Hernando DeSoto, soldiers, explorers, and adventurers sought to tame this hostile new land and its inhabitants for the Spanish Crown. Spain established a string of mission-forts and the city Saint Augustine in north Florida, but all their attempts to gain a foothold here eventually failed. Be sure to see their authentic armor, military equipment and horses! In the early 1700’s, Creek Indians from Georgia and Alabama began moving in Spanish Florida. They were soon joined by runaway African slaves and members of other Indian tribes. Together, this rich mix of peoples became known as the Seminole. Conflicts with English colonists first, then later with the American settlers, pushed the Seminole ever southward. Adapting to the climate and resources of the Everglades, they developed the open-sided shelter or “chickee”. Each Seminole camp consists of a cluster of these chickees for living, sleeping and a separate chickee for cooking, and preparing food. The British redcoats you’ll see here are from the 60th Regiment of Foot. Military survey parties like this one were sent to map and explore when Spain gave up Florida to Great Britain in 1763. England made little attempt to settle and colonize the vast Florida wilderness, limiting their 20 years of occupation to the established coastal towns of Saint Augustine, and Pensacola. During the American Revolution, Florida remained loyal to the King and became a refuge for loyalists. The citizen army that George Washington inherited in 1775 consisted of militiamen and independent companies of soldiers recruited throughout the Thirteen Colonies. Most had to find their own arms, ammunition and equipment and adopted a wide variety of uniforms. American soldiers wore green, white blue, brown and even purple and red coats at different times during the Revolutionary War, depending on what was available. No uniform regulations for the whole army were issued until 1779, when General Washington divided the states into groups and assigned dark blue coats with different colored cuffs, collars and lapels. The American Continental soldiers at the Old Florida Festival are veterans from the Museum’s Colonial Guard and is dressed in the uniform that was ordered for soldiers from Georgia, North and South Carolina in the closing years of the war. Between 1817 and 1858, the United States fought three wars against the Seminole. The first resulted in the purchase of Florida by U.S. The Second Seminole War, fought between 1835 and 1842, was the longest, most expensive and bloodiest Indian War in U.S. history. Over 4000 Seminole were killed or deported from Florida, as the U.S. government forcibly relocated all of the eastern Indian tribes to government reservations west of the Mississippi River. The Seminole Wars were the only Indian Wars where the U.S. Navy took part in the fighting. Our replica Seminole War fort is built in the most common style. These rough outposts were hastily constructed to provide protection to soldiers and supplies. Our soldiers represent the 4th U.S. Infantry, which served here in Southwest Florida, when several hundred Seminole made a gallant last stand in 1855, during the Third Seminole War. When Confederate cannons opened fire on Fort Sumter, South Carolina, in April 1861, Floridians suddenly found themselves in a shooting war with U.S. government. Despite its small population, and shortage of military uniforms and equipment, Florida would supply more than 15,000 fighting men to the Confederacy and about 1,200 to the Union army. Our Civil War Camp has units from the 10th Florida Infantry, 1st U.S. Artillery, and the Union Navy, that so effectively blockaded Florida’s long coastline, cutting off foreign re-supply of food, medicine and ammunition to the Confederacy. The colorful Zouave regiment was one of many Civil War volunteer units that took the field in flamboyant uniforms, inspired by the dress of elite French soldiers in North Africa. The Internet of the 1870’s, the telegraph sped messages from coast to coast in seconds. Wires connected the frontier with big cities and brought both news and financial information. Telegraphers had to have good, fast penmanship and understand Morse code. Send a message or learn how your name is spelled in code. Traveling medicine shows brought “patent medicines” to the frontier. Pioneers treated a variety of ailments (both man and beast) with varying results. See Dr. Esterline’s magic and medicine show to capture the flavor of this popular attraction. An apothecary shop sold medicines of all kinds formulated by a trained druggist. As more doctors moved to the frontier, drug stores sprung up to supply the medical trade. An apothecary shop could fit a wooden leg, make dentures and sell eyeglasses, soap, liniment and patent medicines as well. The harsh economic climate of Reconstruction after the Civil War led some hardy families to move to the Southwest Florida frontier to star anew. Coming by oxcart, and sailboat, they cleared land, built cabins of plentiful pine and cypress, and supported their families by hunting, fishing, and farming. Proud, independent, and resourceful, these first pioneers grew or made nearly everything they needed to survive and prosper in the Florida wilderness. Glimpses of pioneer life are provided by our crafts folk, blacksmith, General Store, and traveling Medicine Show. If you think you’ve seen and heard everything, be sure to have your head examined by the only practicing Phrenologist south of Tallahassee! Called “a splendid little war” by Secretary of State John Hay, the Spanish American War propelled the United States onto the stage of world politics. The war against Spain also helped heal the great rift left by the Civil War, as boys from both north and south fought side by side as Americans, once again. The war provided by US with a colonial empire, which included Cuba, Puerto Rico and the Philippines. From 1942 to 1945 the third largest city in Florida was one of the Army’s training facilities. Thousands of soldiers and pilots trained at the Naples airfield. Many of them returned after the war to buy property or take up residence. Nearly 50,000 of these armored fighting vehicles were produced to aid the Allied war effort from 1940 to 1945. The Sherman tank served throughout the European Theater, in North Africa, and the Pacific. Traditional food, snacks, art, gifts, and articles of interest to history buffs are available for sale at our festival vendors. Take some time to tour Trader’s Row and do some serious tradin’. The Musgroves, a husband and wife team, who specialize in songs of the Civil War are bring their special blend of music and country humor. Authentic Native American dancer, Ed Winddancer demonstrates traditional music and dance. A fall tradition throughout cracker country, making sugar kept the pioneer family busy cutting and hauling sugar cane. The animal powered cane grinder squeezed the juice from the raw cane. The juice was boiled down to produce sugar, molasses or sugar loaf. An ideal crop for the Florida frontier, sugar cane grew well, could be harvested for several years from the original planting, shipped easily and did not spoil.